You can do this! Our tip sheet will help you create the garden you're imagining! 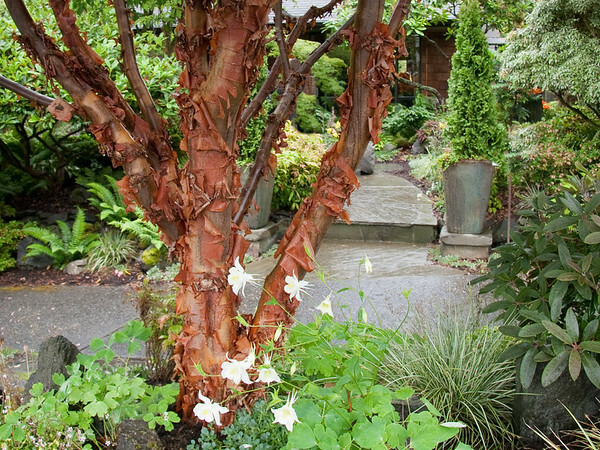 Trees with attractive bark add so much to the winter garden. 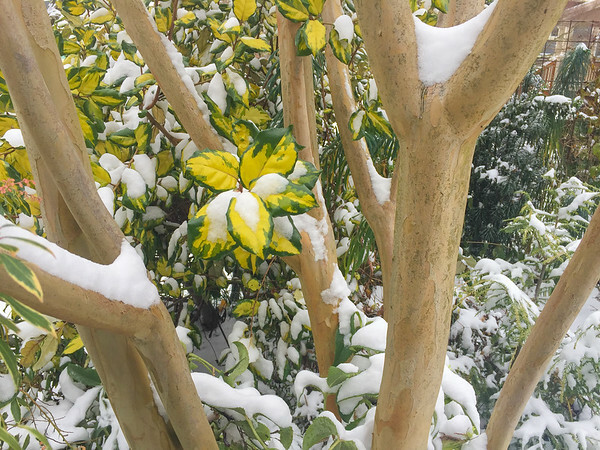 If a tree can pull its weight in the dead of winter, it has a lot going for it and that alone can be plenty of reason to plant it. But the plants I'm showcasing below are more than a one-season-winter-wonder. In addition to a strong showing in other seasons by providing bloom, fall color, or drought tolerance (see individual notes below), I've selected these for their suitability for smaller gardens by virtue of their dwarf stature or relatively slow growth. Acer griseum (Zone 5 to 8) is a small- to medium-sized deciduous tree, prized for its bark, attractive summertime foliage, and red fall color. The exfoliating copper-colored bark of the paperbark maple is a wintertime delight as it positively glows when backlit on a crisp winter's day. 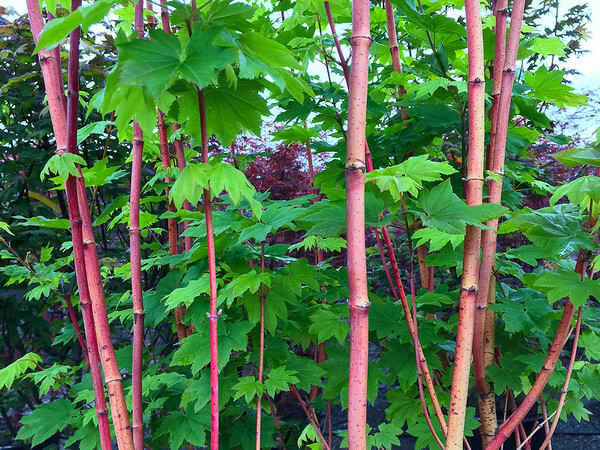 Acer circinatum 'Pacific Fire' (Zone 5 to 9) is a cultivated variety of our Pacific Northwest native vine maple especially prized for its vivid red stems in winter, vibrant green foliage in summer, and excellent fall color. 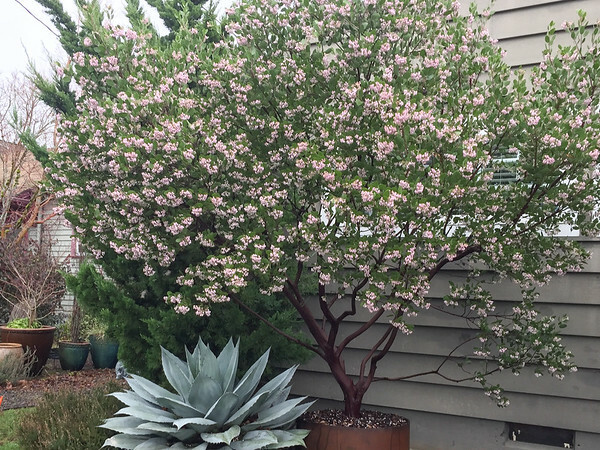 Arctostaphylos 'Austin Griffith'(Zone 7 to 9) is a tough and adaptable selection of the Pacific Northwest native manzanita that's prized for its smooth, sinewy, chocolate-colored bark, early spring flowers, and hearty constitution. An outstanding evergreen shrub or small tree, it requires full sun and asks for little to no supplemental water once established. 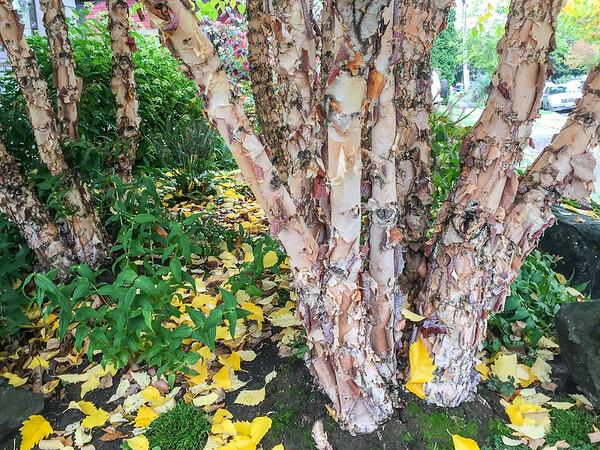 Betula nigra 'Little King' Fox Valley™(Zone 4 to 9) is a dwarf river birch that is still surprisingly uncommon in Pacific Northwest gardens despite its many positive qualities. Chief among them is its fantastic winter bark which unfurls in papery thin sheets in salmon and tan tones. This, coupled with its dwarf growth habit, disease resistance, and drought tolerance make for a pretty darn desirable package. Lagerstroemia x 'Zuni' (Zone 6 to 10), a compact crape myrtle with an upright, vase-shaped growth habit, is well-suited to city gardens. Happy in your hottest garden spot, it will soak up the sun and heat and thank you for it with generous blooms in mid to late summer and good fall color. It's quite drought tolerant but grows best with some supplemental summer water. Stewartia monadelpha (Zone 6 to 8) is a wonderful all-season tree for the woodland garden. 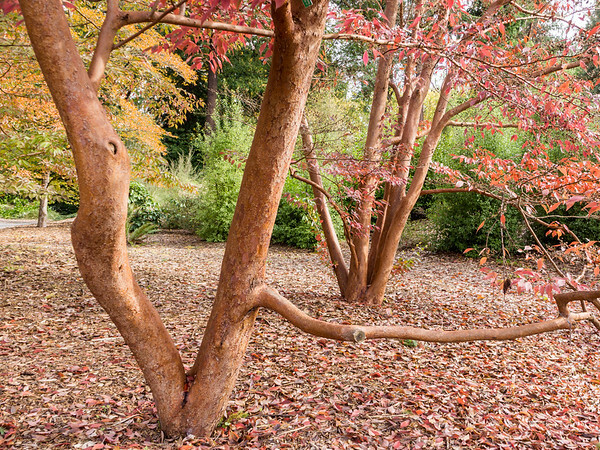 Its close cousin, the Japanese Stewartia (Stewartia pseudocamellia), is a top-notch tree deserving of its widespread adoration, but this stewartia species is another winner and worthy of being more widely grown. It contributes in other seasons as well with delicate, white camellia-like summer blooms, and reliably good, red fall color. It's a slow grower, so get one as large as you can find or afford. The gallery below has even more photos of the trees above. But I've assembled some other photos from my vast archives that showcase other beauties that I've admired. I've identified and commented on most of them, but I don't have full details to offer on them all. But hey, they're still good-looking trees, right? Copyright Notice © 2015 Darcy Daniels and eGardenGo™ LLC. All rights reserved. Unauthorized use and/or duplication of any content, including images, without express written permission from this blog's author and/or owner is strictly prohibited. Terms And Conditions Of Use. All content provided on this site is for informational purposes only. The owner of this blog makes no representations as to the accuracy or completeness of any information on this site or found by following any link on this site. The owner of www.egardengo.com will not be liable for any errors or omissions in this information nor for the availability of this information. The owner will not be liable for any losses, injuries, or damages from the display or use of this information. This terms and conditions is subject to change at anytime with or without notice. Spread the word about our powerful gardening website!